I had a good rummage for a diary entry for tonight. It went on for far too long and now it is far too late, but thankfully tomorrow is Friday. I didn't find anything much of interest. 1994 is the best diary but I was deep in lurve with my first boyfriend at this point in 1994 and some of that stuff is so excruciating I can barely read it myself, let alone share it. 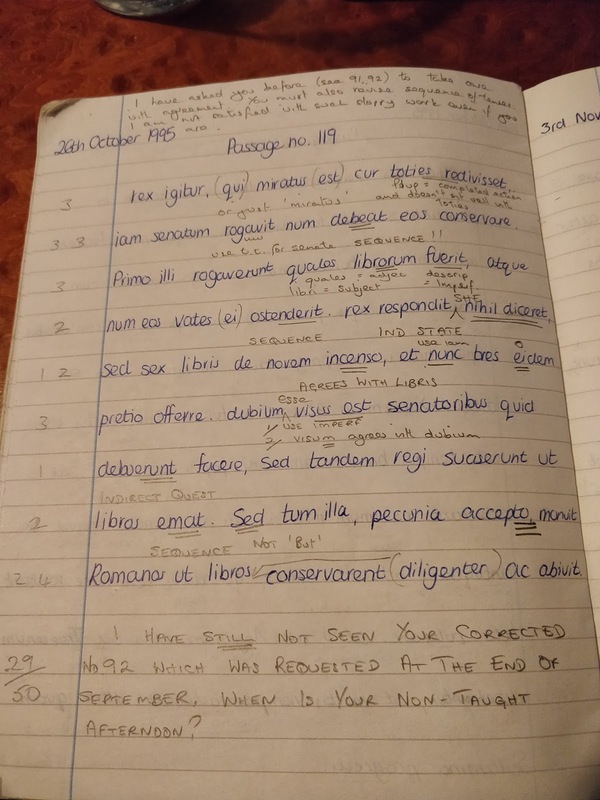 I did, however, find all my A-level Latin books lurking at the back of the drawer, and one of them turned up this gem of feedback, roughly 22 years ago. I have taken a special photograph of the top section, just in case you can't see it, because it's gold. Also, a perfect find on a day when I've had to have conversations with parents about lazy year 13s. I was that lazy year 13. It mostly worked out OK for me, especially in Latin. I can probably get away with worrying a bit less. I'm impressed to see that we were made to go back and redraft our work, and correct the errors. This is a 'new' fad we're loving in teaching at the moment. Not so new.